Today I wanted to share my top picks for gifts for men. Whether it’s a significant other, brother, brother-in-law, or father, I think all of my picks work. Somehow, most of my picks ended up with a travel theme, but alas, travel materials are something most of the men I know don’t buy for themselves, so would be great gifts, especially if you have travel planned in the new year! When I need gifts for men, I got to Mark and Graham or Kiel James Patrick, pretty much exclusively. Shoe Travel Case — Keep shoes away from your clean clothes, and from getting scratched with this amazing leather shoe case! Kiel James Patrick Fleece — Can we just talk about this fleece? KJP has it for men and women, and it looks SO cozy. Personally, I think it looks better on, and I just love the green. Kiel James Patrick Chords — The detail on this pant is so adorable and I checked to see if they made them for women… they don’t. Sigh. But I just love them and think they’d be great with a sweater at the cabin! Leather, Monogram Cocktail Shaker — This adds a personal, fashionable touch to any bar cart. Love it! Dark Leather Briefcase –– someone get a new job? Have they had the same briefcase since the 90s? Will they be traveling for work? Whatever the occasion, this is a great gift to spice up business style. Leather Pouch for Toiletries — this is a great item for travel, but it’s also great for keeping shaving materials and other men’s products organized and stowed away so they’re not crowding the counter. 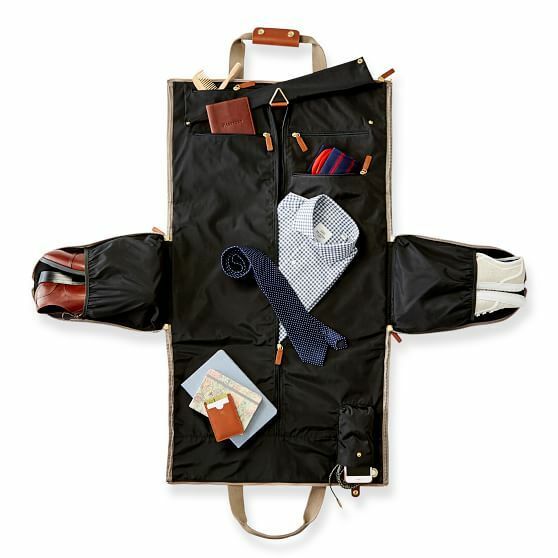 Fold Up Garment Bag — Okay, this is incredible. For men who travel, ever, this bag is a must. It looks like a duffle but folds out into a garment bag that’s super organized. I’m actively trying to find someone I can gift this to because it’s just that awesome. Handblown Whiskey Decanter — Whiskey drinker? This is the perfect gift! What’re you getting the men in your life this year? Oh, Yes you are right if you want to pick some gift for men. Then, you have lots of option like Cloths, shoes, and wrist watch, perfume and etc. But most of the men like shoes, and wrist watch. they both like it. but According to the my opinion that most people likes shoes because every men has a different look in formal shoes. but most of the men like wrist watches. So the Stylish leather shoe if very good for men, and it’s very comfortable and the quality of this shoes is so great with less price you purchase good quality leather shoes https://amzn.to/2PqOtYi. So if you like please give some suggestion.